On Tuesday 18th March pupils from Year 10 competed in a national Maths competition held at Newman College. The competition combined mathematical, communication and teamwork skills. The pupils were competing against other teams including grammar schools. 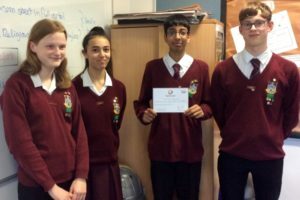 Our team did extremely well and hopefully, all four students will be considering taking Maths at Advanced level in the future.